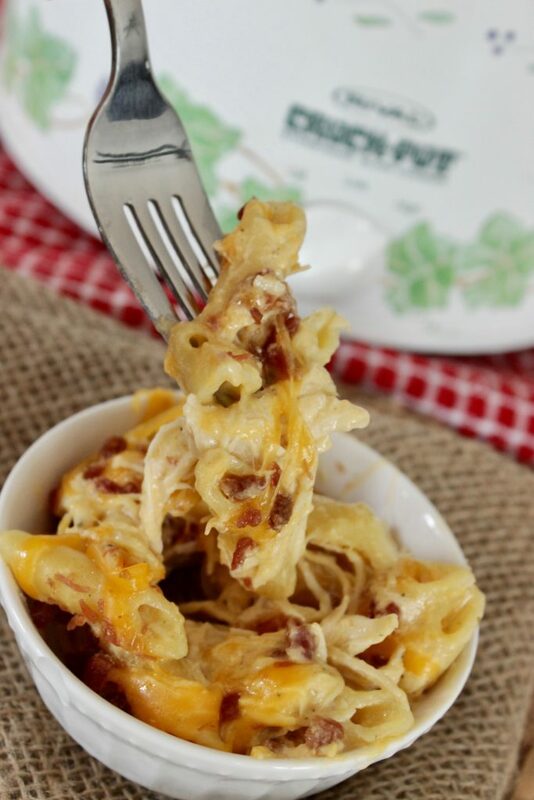 This Slow Cooker Crack Chicken Pasta is SERIOUSLY the BEST! 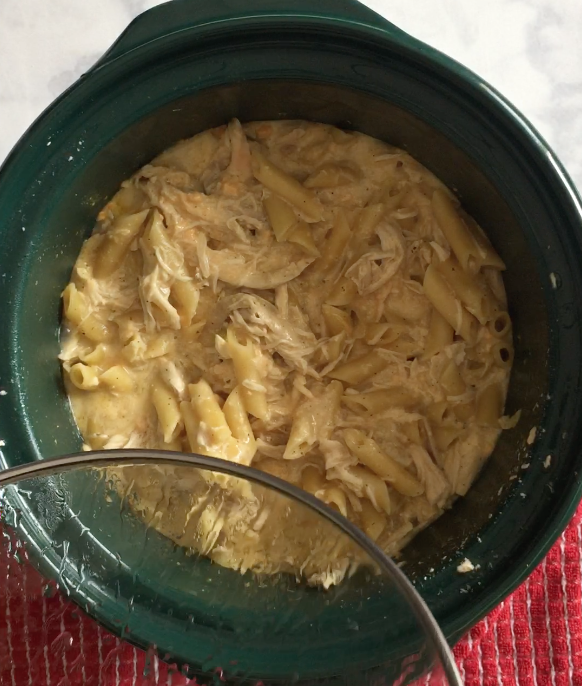 This Slow Cooker Crack Chicken Pasta is going to seriously UP your easy dinner ideas game. 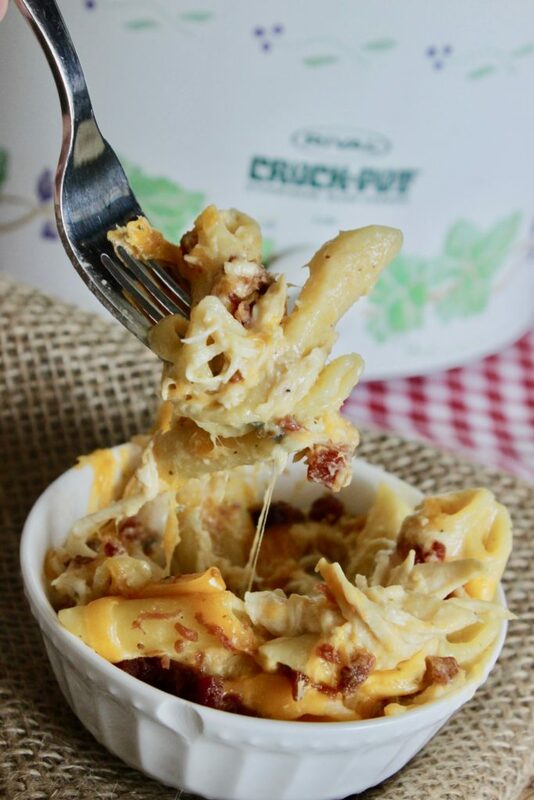 Not only is this crockpot pasta an easy dinner, but it tastes awesome, too. And, the whole family will love it! OK, guys. Do you need an easy dinner recipe that is seriously as easy as it gets and about as delicious as they come?! This crack chicken pasta is just that AND, if I were a betting girl, I’d bet that this will quickly become a go-to recipe for your family as it’s not only the easiest dinner ever (no, seriously), but it’s so, so, so good. It’s a lot like my crack chicken sandwiches but it’s a pasta. I’m a huge fan of the crock pot. The crock pot allows me to go into the evening calmer than the nights usually are (hey, I’m just being honest). Usually I get some pretty decent sized anxiety around 4pm trying to dream of what I can whip up in an hour that my whole family will love. 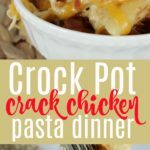 Anywho, here goes – my new favorite dinner – crack chicken pasta in the crock pot! Grab all of your ingredients and get them together of course – that’s what every good cook does, right (I’m being totally sarcastic!) I never do this, but I’d love to be this organized, so big kudos to you if you are! Cream all of these ingredients together and whip that puppy up. Let it cook on high for three hours. You’re basically letting these flavors all come together and blend. You’re also getting the liquid hot enough to then cook the pasta once you pop that in. Once this has gotten up to the right temp after three hours, add the pasta. Yes, uncooked (I promise — this is what makes this magical — because then you will literally stir, and walk away) Yes — Have I mentioned how much I really really really LOVE my slow cooker? Honest to goodness. Best thing since sliced bread. After 20 minutes, give the pasta combo a quick stir, put the cover back on, and then stir again after ten minutes or so. 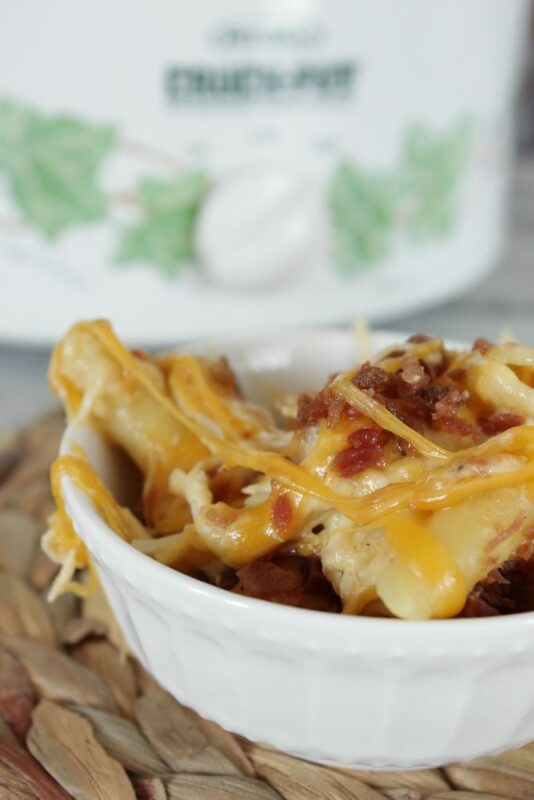 Give it another good stir and top with cheese and bacon pieces – And let that cheesy amazingness melt for 5 minutes or so – you’re literally watching dinner be made, but not by you! Ha — LOVE it! Next, well, enjoy! This makes enough for about 6 servings. Is it really possible to make a crockpot pasta? 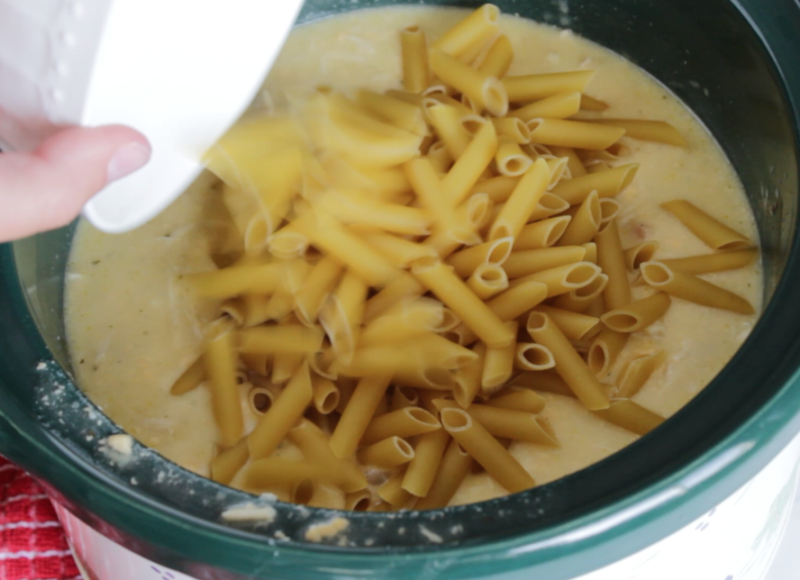 It sure is possible to make a crockpot pasta. Follow the directions I have outlined in this recipe and your crack chicken will have pasta in it. The pasta will be tender and delicious as it cooks in the slow cooker crack chicken recipe. 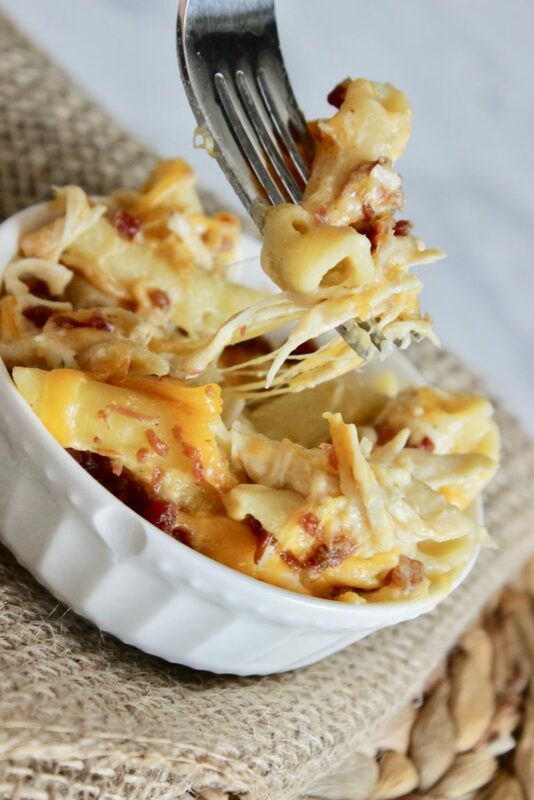 This slow cooker crack chicken pasta will make your life easier - I can PROMISE you that! When do you add the ranch dressing mix? With the chicken and broth, cheese and water? Can you use chicken breast and throw them in the beginning? Are the bacon pieces cooked or uncooked when you add them in? When do you add the ranch packet? It doesn’t say in the recipe above! You can add on the chicken before add the cheese sauces water and chicken broth. But i was looking for it as well when i first attempted recipe and added in crock pot. i think they forgot to put that it should be added when mixing everything. I am so sorry for a really dumb question…. do you cook the chicken ahead of time them shred it? or is it raw chicken that gets cooked while in the slow cooker? Sorry I am a newbie cookie and this recipe looks so yummy and easy! Rotisserie chicken is what the recipe calls for & it is purchased at the grocery stores already cooked. Actually, raw chicken would be almost impossible to shred. I would add the ranch dressing when you add the pasta. Can you substitute another cheese for the Velveeta? My hubby can’t have Velveeta. Great idea! I wanna try that too next time. Making this now! Thanks! Wanted to add that you forgot to add the ranch packet in to the directions though it’s only on the recipe list. I would like to know what size soup also. Usually recipes use the normal size can soups unless specified, go with the 10.5oz can. Has anyone tried this?! And does the author of the recipe ever respond?! HAS ANYONE MADE THIS? IF SO HOW DID IT TURN OUT? Wow! yummy recipe we could enjoy this any time. Whenever we are hungry especially in midnight we can make it easily. I suggested this blog to my wife that she read and understand it and make this yummy pasta. She ordered many foods with discount coupons via online sites. But thanks to you now I think she can make this pasta easily at home. Is there an option for a 6-8hr crock pot recipe? For a 6-8 hr version I am going to try using raw chicken breast. Cut the chicken up in chunks & continue with reciepe as stated except cook on low. Turn to high when you add the noodles. Or I might consider boiling the noodles separate & mix into sauce, then add cheese & bacon on top and cook the additional 20 minutes.